If you’re struggling with being bisexual, or need support with any aspect of life relating to bisexuality, then I offer personal coaching services via Skype or phone. Being bisexual is hard. It’s often a lonely experience, too, as partners, friends and family are not always as supportive or understanding as we would like. Connecting with a personal coach who understands bisexuality and who can be there to listen and support you can make all the difference. Personal coaching is tailored to you and your needs. It’s non-judgmental and aims to encourage and inspire you to overcome difficulties and live the life you want. 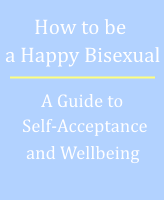 Whatever aspect of your bisexuality you’re unhappy with, I can help you deal with it.